Plate fourty from 'Picturesque Scenery in the Kingdom of Mysore' by James Hunter (d.1792). 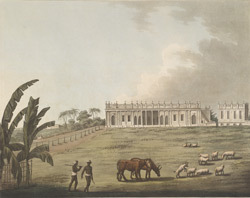 This aquatint is based on a picture by Hunter of a house belonging to William Hunter at Bankipur, to the north of the city of Patna (Bihar). Perhaps William Hunter was related to James Hunter. There was a Senior Merchant in the East India Company's service named William Hunter who was based at Dinajpur (Bangladesh) during James Hunter's time in India. Perhpas this is the same person.